The sophistication of a ruby is given an eye-catching contemporary treatment in this tension set ruby engagement ring in 14K yellow gold. A 6.5mm round ruby instantly draws the eye from the center of this modern solitaire ring; its rich, deep red sparkle seems to float above the wearer's finger as it's hugged by a tension setting that materializes gracefully from the shining 14K yellow gold band. 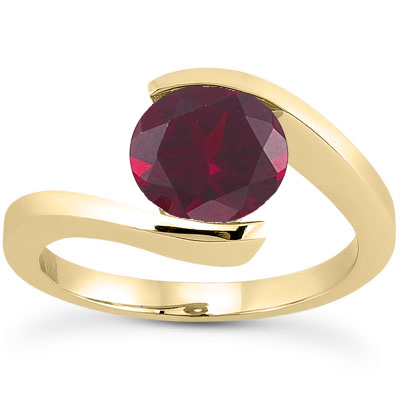 This chic combination of crimson glimmer and golden shine is simple yet eye-catching. 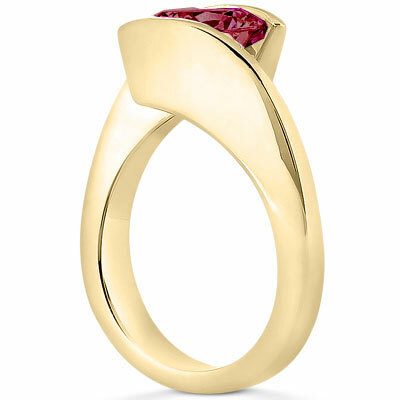 A beautiful vermillion red ruby is tension set in 14K yellow gold. Also available in 14K Rose Gold, 14K White Gold or Platinum by request. We guarantee our Tension Set Ruby Engagement Ring, 14K Yellow Gold to be high quality, authentic jewelry, as described above.